Well, a few weeks ago I was talking to my Mom about different projects that require a sewing machine and that I should probably invest in one eventually. She sure made my day, week, month, year by telling me she had a sewing machine, still in the box, that had been sitting unused for the past 9 years and that I could have it! I was beyond excited!!!! Only problem? I hadn't sewn since a was 13, in my eighth grade sewing class! So with the help of a few good friends (you know who you are;), I learned how to thread my bobbin, machine and learned a few basics! So for the past few weeks when my little ones go down for their afternoon naps, I go in my office, turn on the Christmas tunes and sew my heart out! It's so fun! I had no idea what I've been missing all these years! Now, for one of the first little projects I made! 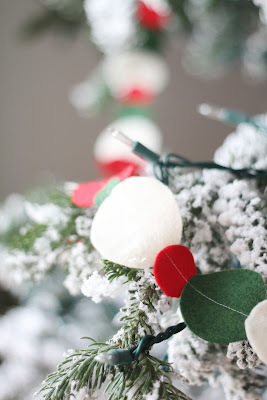 Felt garland! I used leftover felt from last years (no sew) tree skirt project, cut different sized circles free-hand and then sewed them together in a straight line. I got my inspiration from the fun Dot garland Bri did for Lil's birthday party last January. We decided to get a real tree for our family room this year. This is the first tree we saw when we drove up to the lot! We loved the shape but didn't love that it was flocked, so immediately set out to find the same shaped tree o'natural! Well, obviously we were unsuccessful with finding exactly what we wanted, so we went back to this flocked tree, got brave and decided to go for it! 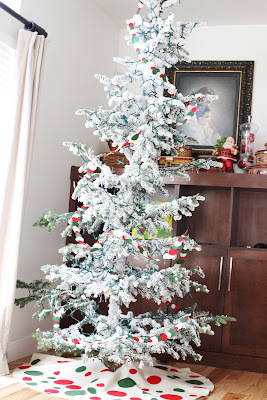 It's messier but I have to admit, I'm kind of digging the retro/homely vibe this tree gives! Success!!! !